There comes a time in every fisho’s existence, in which we’re all presented with an opportunity to experience new gear. One moment, for me, was during an extended trip to the remote East Alligator River in the Northern Territory. Leading up to this trip, I had the pleasure of equipping myself with an Atomic Arrowz Barra AAS-60MH Spin Rod. As I removed the rod from its protective bag, I instantly felt its quality, and upon closer inspection, the strength and superior craftsmanship that had been engineered into this remarkable rod. I coupled my reel to the Arrowz rod, in preparation for what would be a challenging, yet very rewarding experience, on one of the Northern Territories premier rivers. You could forgive me for being a little nervous, as I hadn’t yet given myself the chance to become accustomed to this rod, before embarking on this journey. My excitement soon quelled this apprehension, as the Arrowz rods reputation well proceeded it, and was reputed to perform true to its character. The Barra must have been aware of our arrival as they were difficult to locate, eluding us for a time, but after some persistence, systematic field research, and a little luck, we dialled into the fish. Taking up my reel, now bonded with a brand new Arrowz rod, my anticipation was frothing. This sense of unsureness was quickly replaced with reassurance after my first few initial casts, which solidified my confidence in the rod. 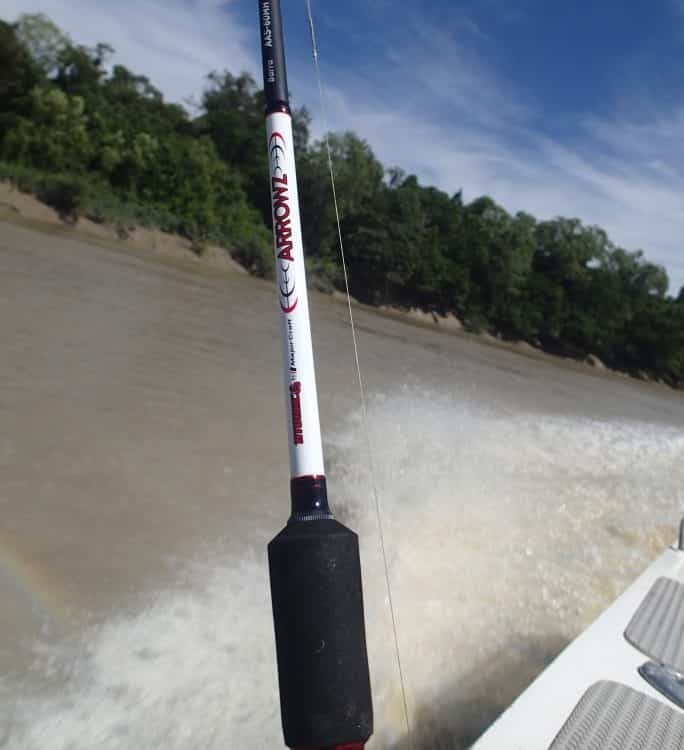 No sooner had we graduated through the test drive phase, the rod was put to the test as an explosion of white water erupted where my Atomic 100 deep minnow was only moments ago, calmly guided through the discoloured outflow from one of the many feeder creeks. A good sized, yet ill tempered, Barramundi had taken a liking to and attacked my lure from beneath, in fine, predatory ambush fashion. Like a well-tuned machine, the rod took the initial impact, giving its rebuttal with perfectly balanced reaction, it set the hooks, and the rest was up to me. Every action the fish threw, the rod responded with an equal and opposite reaction, enabling me to fight the Barra, anticipate its next move and formulate a battle strategy, which would ultimately see its inequitable submission. This exchange of blows continued on until the Barra gave in and lay beat alongside the boat. Well exhausted and truly outmatched by the Arrowz rod, the Barra was netted and brought aboard. With hooks removed, the Barra was tagged and then released, to support, and further value add, to the continued research into Australia’s premier sports fish. As I sat to ponder and reflect on the events which had just transpired, I came to realise that this Arrowz rod had given me something which no other rod had given me before; 100% confidence in its capacity to empower me with the ability to complete the capture. The Atomic Arrows rod is a revolutionary piece of engineering and something which I recommend all fisho’s try at least once throughout their fishing career.